taking notes at work or in class? Join Maureen Vickery, a professional calligrapher and hand lettering artist, as she teaches you the basics of making your handwriting beautiful, legible, and enjoyable! We’ll use the Italic alphabet as the foundation for practicing proper penmanship. This alphabet has been around since the Renaissance, and it’s incredibly versatile. It looks beautiful either printed (unjoined letters) or cursive (joined letters). You’ll receive a packet of practice worksheets as well as a resource list and tips for further study. All supplies will be provided. However, if you have a favorite fountain pen or gel pen that you’d like to use during class, feel free to bring it! A bonus for taking this class is that you will learn fundamental calligraphic principles that will give you lots of “hooks to hang things on” should you decide to branch out and take calligraphy classes later on! We’ll provide light snacks and drinks, and BYOB is welcome. We’ll also throw in a few door prizes to add to the fun! This class is ages 16 and up only. Seats are limited to allow for individual attention and Q&A time, so sign up today! Doors will open at the Flower Bar at 1:00pm so you can pick a seat, grab some refreshments, and chat with Maureen and fellow handwriting creatives before class starts. They are on the second floor, Suite 230. After the workshop is over, you won’t be left on your own! 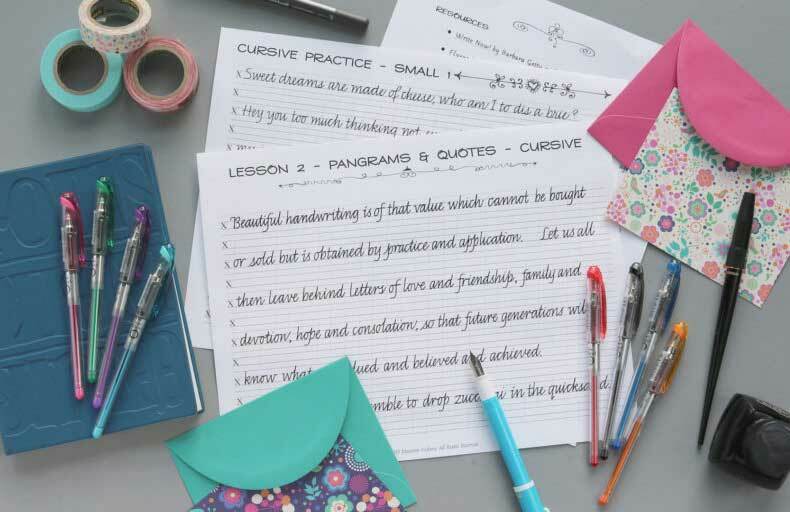 Students can email Maureen at handwriting@pendancestudio.com to ask questions about handwriting practice and receive one free handwriting critique (after practicing a few weeks first!). Refunds are available up to 1 day before the class date.